It is with great pleasure (mixed with a healthy dose of empty nest syndrome, chased with a glass of pride) that I finally get to announce something that has been in the works for awhile now. Justin Bieber is getting a new tattoo. For the legions of Bieber fans that also love funny Disney stuff, this is about as good as it gets. And on top of everything, I should also mention that my first novel (what the French call a debut) is finally available for purchase on Amazon. Am I allowed to spend a whole post talking about myself? Because today I’m going to. Hey, it’s my site, so you’ll have to indulge me a little self-promotion on the day my novel comes out. Let’s face it, after all the awesome Lindsay Lohan jokes and John Muir references I’ve treated you to over the years, I think it’s only fair. The book itself actually has nothing to do with Disney, but just so I’m not completely off-topic, there is a Disney connection, which I’ll share at the end. Crisscross the centuries on an epic treasure hunt for a lost pirate fortress! Anne Dubois be a right cunning lass, whose legendary sword carves a vicious brand of buccaneer vengeance across the Spanish Main. But when she chases a fabled jewel into uncharted waters, only All-Star quarterback Johnny Socko can solve the mystery of her disappearance. Now he must dive every shipwreck, decipher every code, and deploy every gadget in his supersleuth arsenal to escape a similar doom. 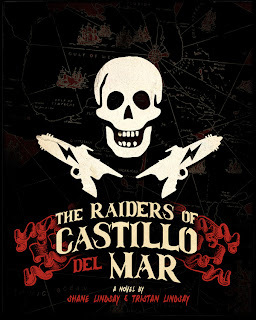 THE RAIDERS OF CASTILLO DEL MAR is a rollicking send up of 1950s teen detective fiction, fused with a powder keg of swashbuckling adventure. Anne and Johnny are two halves of the same treasure map, destined to collide in the tempest-tossed Caribbean isles, where an unholy secret lurks in the dread spires of Castillo del Mar. She vows to plunge the stronghold into darkness. He plans to light it back up. Sounds great, right? My brother and I have co-authored this, and it’s been a few years in the making, but we think we have one of those stories that is fun from start to finish. High adventure with the pirate stuff, and a comic sci-fi vibe in the teen detective stuff. The coolest part is that the story has this alternating structure, so that neither side (pirates or teenagers) understands the whole puzzle until the end. Also, this book is for young adult readers on up to full-blown adults (the ones who like things like theme parks; we don’t want any stuffy, un-fun adults reading it). In other words, it’s a book the whole family can enjoy (sounds familiar). The price is extremely affordable: Just $2.99. So if it sounds like something you might be interested in reading, please buy it! It’s cheaper than a large fry at Cosmic Rays. Heck, you could buy two copies for the price of a vinylmation! And if any of you want to review it on Amazon, share it on Facebook, book me on Oprah, well, I’m not going to stop you (the Oprah thing would be cool though, especially since I hear she retired). Right now, it’s available exclusively for Amazon as a kindle ebook. What if you don’t have a kindle? You don’t need the actual device! That’s what makes it so awesome! All you need is a PC, Mac, iPhone, iPad, Blackberry, Android, or Atari 2600 and you can download the FREE Kindle app! Of course, that means you’re reading it electronically rather than on paper. We don’t have a hardcopy version just yet, publishing economics being what they are, and what are you anyway, some kind of tree-killer? (that’s a joke; we’re working on getting a printed version out there, but because this is a good-sized novel, the price is liable to be… more). If you were to ask me to compare it to another book, I would say it’s like Harry Potter meets Twilight, wrapped up in the DaVinci Code — but that’s only because I have unrealistic sales goals. No, actually, this story had two inspirations. One, I was a huge Hardy Boys fan as a kid. And two… I think you Disney fans know what really provided the inspiration for this story. Now just where in Walt Disney World can you find this? This entry was posted in Theme Park Life and tagged The Raiders of Castillo del Mar. Bookmark the permalink. Thanks Teev and Trendicoff! I am very excited, and people seem to really enjoy it, which thrills me to no end. I appreciate the support! I’m glad to see you get this out there and I hope the visitors to our site are motivated to check this out… DO IT!